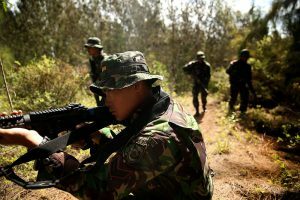 As part of overall US strategy in the Pacific region, the US is attempting to forge a closer economic and military relationship with Indonesia. The Obama administration made improving ties with Indonesia a major priority when President Obama first took office in 2009. The White House and US State Department have maintained that priority during Obama’s seven years in office. The White House has always been quick in declaring diplomatic victories following overseas trips by the President as well as after meetings with visiting heads of state and their ministers. 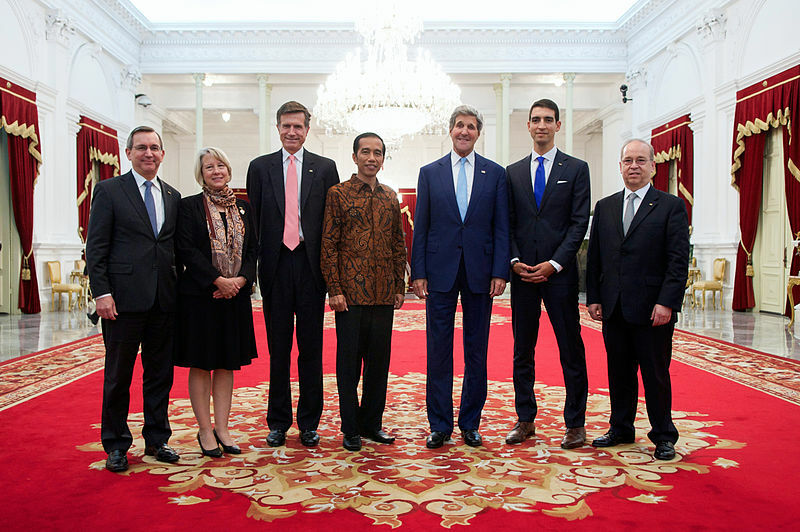 In reality, the US-Indonesia “new alliance” remains a work in progress. With the Philippines, Japan, and to a lesser extent Malaysia, we can clearly measure progress in the formation of a transpacific alliance in response to increased aggression from the People’s Republic of China. It is much more difficult gauge Indonesia’s intentions toward the US, its Pacific neighbors, and Communist China. To interpret the foreign policy news from Indonesia, we need to consider a few critical facts concerning the Indonesian national identity. First, like the Philippines and Malaysia, and unlike Japan, Indonesia lacks cultural unity. Foreign policy is important to Indonesia, but internal issues remain their day-to-day first priority. This does not mean that we cannot build real cooperation with Indonesia. It means we can’t expect it to be represented the same way in the Indonesian media as it would be in other countries in the region. Second, Indonesia is the largest Muslim country in the world, but it is a secular democratic state. Over 85% of Indonesians describe themselves as practicing Muslims, but Islam in Indonesia is far less “centralized” and regimented than in Saudi Arabia. The national legal system is secular. Radical Islamic groups do exist, but they lack anything approaching popular support. Indonesia acts independently of their fellow Muslim countries in the Mideast, but the country is never comfortable publicly disregarding “Muslim interests” in favor of US-Indonesia relations. The White House should not expect Indonesia to trumpet US-Indonesian cooperation loudly. Indonesia is showing clear signs of growing cooperation against China and growing cooperation with its neighbors, but it has to handle the public relations battle in the way that best suits its government and its people. Indonesia’s neighbors seem to understand this better than the US does. While the US and Japan are always concerned with the public message that is delivered to the People’s Republic of China, we cannot expect Indonesia to pursue a similar public relations strategy in the near future. The good news is that it is quietly willing to increase military cooperation with its neighboring states and the US. A third fundamental fact concerning Indonesian national identity is that Indonesia sees itself as being the leader of the region. Indonesia was instrumental in founding the Association of Southeast Asian Nations. The headquarters for ASEAN is in Jakarta, Indonesia. ASEAN remains a major point of pride for the Indonesian government and people. It is something that they accomplished without the US, the UN, or anyone outside of the region. ASEAN is, in a sense, a symbol of Indonesian power and political identity. 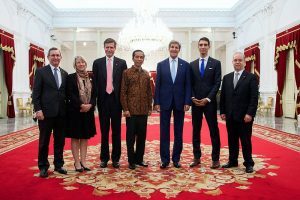 Rather than disregard ASEAN, the US can work with ASEAN on the same issues over which the Obama administration has been trying to gain Indonesian cooperation for the last seven years. The US sees itself as being the leader in improving regional security against growing Communist Chinese aggression in Southeast Asia. The US strategy in the Pacific is based on shared concerns, but it relies heavily on US technology, military expertise, and US cash to improve defense capabilities in the region. In the case of Indonesia, the US will have to remain patient and allow that country the opportunity to redefine a US-Indonesian relationship that can fit into its national agenda. If that includes Indonesia being less publicly supportive of US-led initiatives in the area, then so be it. The White House must measure Indonesian policy and actions and ignore Indonesian rhetoric. In Indonesia, the rhetoric will never align with real policy quite the same way as it does in the Philippines or Japan. A fourth major formative issue in Indonesia’s relations with the US is the People’s Republic of China. China has lots of cash, and Indonesia needs Chinese trade and investment. We are asking Indonesia to abandon investment and trade from China at a time when the US national debt does not present a bright promising picture of economic perfection. This is not 1960, when the US was able to present a breathtakingly brilliant comparison to the dismal economies of the USSR or Communist China. Like any government, Indonesia cannot ignore its own business sector when conducting foreign relations. When it comes to economics, ASEAN can help bring Indonesia and the US closer in economic terms. Healthier regional and transpacific trade will help allow Indonesia to more confidently decrease economic ties with China. Deciphering US-Indonesian relations takes some work, but one important positive fact gives reason for optimism. Indonesian democracy is stronger and more stable today than it was ten years ago, and the practice of democracy seems to be growing more complete each year. The Indonesian people know that their democracy is not perfect, but for the majority of Indonesians, expectations for democracy appear to be growing. In assessing the current state of US-Indonesian relations, there are reasons to be optimistic. One of the greatest forces driving a closer US-Indonesia relationship is China itself. Communist China has consistently shown itself to be unable to resist using intimidation and brute force when dealing with its Pacific neighbors. In theory, China believes in the “carrot and stick” method of diplomacy, but it has shown itself to be unskilled with the carrot and impatient to use the stick. Until very recently, Indonesia was carefully hedging its diplomatic strategies with regard to China. Recent news reports from Indonesia indicate a reluctance to see the US take a leading role in regional security. Indonesian actions tell a different story. Indonesia recently (again) warned the People’s Republic of China that Chinese fishing boats illegally fishing in Indonesian waters would be detained. When Indonesia recently attempted to seize a Chinese fishing boat that was illegally fishing in Indonesian waters, the Chinese Coast Guard intervened and prevented the seizure. Indonesia was publicly outraged by the incursion and has filed a formal complaint against the People’s Republic of China. China will ignore the complaint, but in exchange for proudly saving one illegal fishing vessel, it has seriously damaged relations with Indonesia. If the Obama administration has been somewhat clumsy in its attempts to expand the US-Indonesian alliance, it can at least count on its one sure bet – China enjoys flaunting its increased military ability in the Pacific. It plays well in the government-controlled media in China, but it undermines China’s own foreign policy goals. In my estimation, relations and economic ties between Indonesia and the US will improve and, more importantly, Indonesia will focus on improving relations with its own neighbors in the region. Next week we will consider US-Australian relations and the part that Australia plays in regional security in the Pacific. Thanks again, Jay. I always figured Indonesia was just another Muslim country looking for a chance for jihad. I never realized there was a difference.